Genuine, fresh and natural. These are the three words that best define Grissini Italian Chef, Antonio Cocozza’s cuisine. 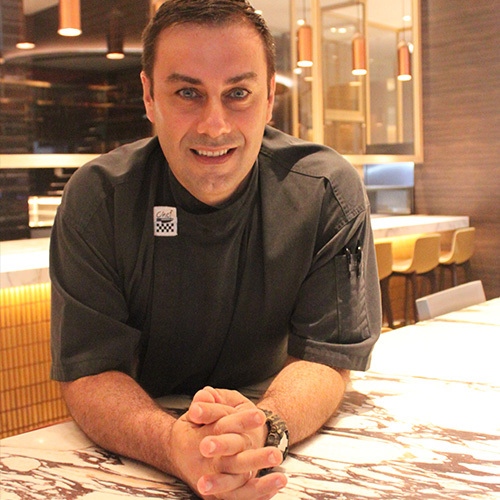 Chef Antonio who helms Grissini, hails from Naples, located on the Southern coast of Italy, where pizza was created. The affable and down-to-earth chef who graduated from Ippolito Cavalcanti has over 27 years of culinary experience and has honed his skills in renowned restaurants in the UK, Italy, Australia, Russia, Africa, China and Singapore. Chef Antonio’s cooking style is innovative, yet genuine. He believes in marrying fresh and premium ingredients with natural herbs to create authentic Italian flavours with a difference. He infuses passion, dedication and finesse in his craft, whipping up delectable creations from his hometown. Many of his recipes are inspired by his mum who thought him the basics of cooking at a young age. His interest in cooking grew when he was a teenager and he decided to pursue a career as a chef. His passion led him to start a restaurant in Singapore a few years ago. Over the years, Chef Antonio has experimented with many different cooking styles and has created a signature style of his own. He has curated a menu at Grissini which focuses on authentic pastas, pizzas, premium meats and seafood along with a twist on classic favourites. Chef Antonio has an amicable and spontaneous personality which is reflected in his cuisine. He believes that fresh produce is the main essence of good food. “Originality is also important. A good chef can marry different ingredients and herbs to create various textures and flavours, however, there is no need to transform the dish too much.” he added.